As you will have probably heard, October is Breast Cancer Awareness Month in the UK and to help the cause the lovely Sarah from A Million Dresses is organising a bloggers raffle. 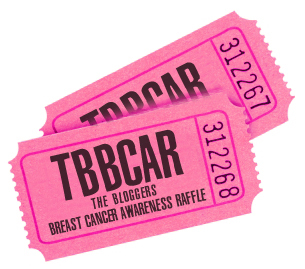 The Bloggers Breast Cancer Awareness Raffle was started last year by Sarah at Essbeevee, and will this year take place on Friday 26th October. There are some fantastic prizes up for grabs - see a full list here - and I've highlighted a selection of my personal favourites below. To take part you just need to visit this Just Giving page and donate money (only donations made on the 26th will count for the raffle). For every £2 you donate you will get a raffle ticket (please the note the raffle is open to UK residents only). You don't need to be a blogger to enter, so make sure you tell your friends, family, colleagues etc! The Breast Cancer Awareness Campaign is a fantastic cause so a big thank you to Sarah for organising this! If you want to find our more info on TBBCAR then check out Sarah's blog.